Kim Wagley has been involved with Susan G. Komen in the Wabash Valley region since 1998. That year, she attended her first Race for the Cure in Terre Haute and she has been heavily involved as a volunteer ever since. Initially, Kim was involved as a Race team member. In 1999, the person who captained her team handed her the reins, making Kim the new team captain. Kim says she hasn’t looked back since. No matter the circumstances, Kim continuously dedicates herself to recruiting team members for the Wabash Valley Race for the Cure, which happens in Terre Haute each October. She draws inspiration from her co-workers who start asking how they can help and where to sign up by June, even though the event is still months away. For a few years, Kim was the leader of three teams at once—one for work, church, and her local yarn shop. She even encouraged her daughter to head up a team while in middle school, and her daughter created a recruiting commercial for the school TV station! Kim prides herself on consistently being the first Race team registered each year, which she recently accomplished again for the 2017 Wabash Valley Race. She enjoys registering her team within moments of the website going live. In 2015 she was the captain of the largest team with 113 members, and they won an award for having the most people in attendance at the Race, and for having the second highest fundraising total at nearly $3,000! “While it was fun winning those awards two years ago, my favorite Race is always the current one because it holds so much potential,” Kim said. This year, Kim is involved in planning the Wabash Valley Race and will be lending her expertise to other team captains, helping others increase the size of their teams to boost their fundraising efforts and make a larger impact in the fight against breast cancer. 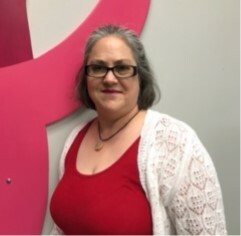 As a dedicated volunteer, Kim believes Komen is important because the breast cancer is an equalizer with no consideration for race, gender, or social strata, and Komen reaches out to all. Kim continues her work with Komen in honor—and in memory—of her aunt and many friends. She will be walking with her team in the 2017 Komen Wabash Valley Race for the Cure on Saturday, October 7. Interested in getting involved as a volunteer like Kim? Learn more about opportunities and how to get started.